(CNN) -- Nine-term Democratic Rep. William Jefferson, who has been battling scandals and a federal indictment for the past three years, lost his bid for re-election on Saturday. Louisiana Democratic Rep. William Jefferson has been embroiled in a bribery scandal. Republican challenger Anh "Joseph" Cao, an attorney and community organizer, defeated Jefferson in the 2nd Congressional district race. He will become the first Vietnamese-American elected to Congress. With 100 percent of precincts reporting, Cao had almost 50 percent of the vote to Jefferson's 47 percent. The 2nd Congressional district, in and around New Orleans, is mostly African-American and heavily Democratic, and Jefferson appeared to be favored to win re-election going into the election. "The people of the second district were able to transcend party, transcend race," Cao said after claiming victory Saturday night. Voters also chose Republican John Fleming over Democrat Paul Carmouche in Louisiana's 4th District by a slim 356-vote margin. Fleming will replace retiring 10-term Republican Rep. Jim McCrery, a top-ranking Republican on the powerful House Ways and Means Committee. Elections in the districts were delayed after Hurricane Gustav hit Louisiana in September, setting up what should be the last two federal contests of 2008 on Saturday. Both races had two other contenders who drew a small percentage of votes. Jefferson has pleaded not guilty to 16 criminal counts of racketeering, bribery, money laundering and obstruction of justice. He denies any wrongdoing. In 2005, Jefferson's private homes in Washington and New Orleans were raided, and FBI agents say they found $90,000 in cash stashed in one of his freezers. Officials say the money was part of a payment in marked bills from an FBI informant in a transaction captured on videotape. Jefferson also is accused of soliciting and receiving hundreds of thousands of dollars in bribes for himself and his family in exchange for promoting their products and services to countries in Africa. In the 4th District, in the northwest corner of Louisiana and including Shreveport, McCrery announced in December 2007 that he would not seek re-election, opening up a GOP seat and setting off a campaign that attracted national attention and money. The race pitted Webster Parish coroner Fleming against Caddo Parish prosecutor Carmouche in what political observers considered to be a toss-up. The Louisiana secretary of state's office had predicted light voter turnout Saturday. "The election is in December near the holidays, it was delayed from when it was supposed to be, and our prediction was that those factors would keep turnout low," said Jacques Berry, spokesman for the secretary of state. 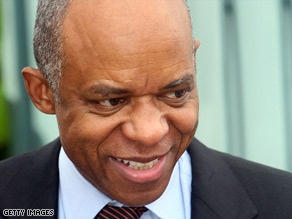 President-elect Barack Obama recorded a radio ad on behalf of Carmouche but stayed quiet on Jefferson's re-election bid. A Jefferson spokesman said the congressman had not asked Obama for such help.